Systems that are capable of adapting to complexity are naturally drawn to attractors. Think of putting a marble in a salad bowl. It will find a resting place in the bottom of the bowl – the space it is attracted to. In human activity systems, values are critical as attractors. And conversations about what we value, such as the conversations around major hazards in an unsafe workplace, are an essential way of shaping systemic behaviours in the face of complexity. “Kuhn says that the criteria of choice between theories… “function not as rules, which determined choice, but as values, which influence it” (page 331). Most of his critics would agree even to this…” (5) Against this backdrop, we could understand the work of normal science as a set of conversations where “iteration will fill out the attractor in more and more detail.” (6). Note this– even science has its system activity defined by values. Turner goes on to raise the stakes even higher: “Meaning itself can be redefined in terms of the relationship of strange attractors to the physical processes they describe. Any nonlinear dynamical system, when triggered by a stimulus, will generate a sequence of unpredictable events, but those events will nevertheless be limited to their attractor, and further iteration will fill out the attractor in more and more detail. “ “Meaning itself” is my emphasis. So conversation between ourselves to progress in the face of complexity truns out to rely on us clarifying and stating our values in a way that is anything but peripheral. It is not lip service, though it may be treated as such. Understanding and expressing our values has a critical role in complex situations – it creates a boundary to relevance. This leads to some further interesting possibilities for reflections about the relationship between conversation and culture…. “Organisation culture is the emergent result of the continuing negotiations about values, meanings and proprieties between the members of that organisation and with its environment. (2) Health Care Organizations as Complex Adaptive SystemsJames W. Begun; Brenda Zimmerman; and Kevin Dooley. June 15, 2002. (9) Seel, R. (2006) ‘Emergence in Organisations’. Online. Available HTTP: <http://www.new-paradigm.co.uk/emergence-human.htm> (accessed August 2013). All the numbers from the pathology lab are good, the paperwork is complete, and…. the patient is dead. A US doctor invented a word for this sad phenomenon in health care: “the patient is “euboxic””. “Eu-” meaning good, as in euphoria and eulogy; “boxic” referring to all the little tick boxes neatly filled in (and no doubt a blackly humorous allusion to the coffin shortly in order. The truth is that human diagnosis is a complex task, and it can’t be reduced to algorithms in pathology laboratories, even though they make a vital contribution to the task. Pathology testing is a place for routine expertise. Diagnosis is a task for adaptive expertise. Adaptive expertise is essential in working with complexity. Routine expertise works in contexts where there are stable specifications for the work. Adaptive expertise is required when the problem space has moved “upstream” – it comes before the specifications could even be written. It comes when even the requirements themselves are changing. Facing complexity drives our thinking “upstream”, insisting that thought is given, and shown to be given, to the front end thinking processes that are essential to viable and sustainable systems, and requiring conversational capabilities for competence in those spaces. McMorland describes adaptive expertise in the context of senior management (where we might expect to find it routinely, but often don’t). 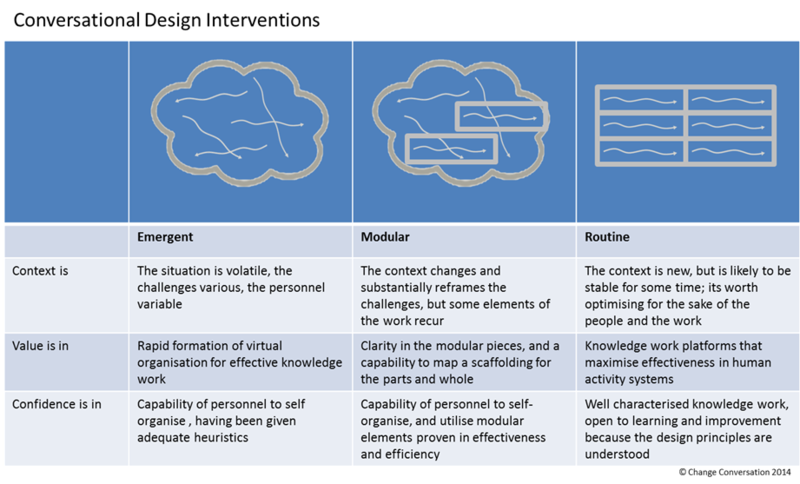 With high speed change, very plastic organisation arrangements (value chains), and growing complexity, the only constant will become that we know how to navigate conversation spaces – an adaptive competence. Enterprise velocity x complexity x plasticity demand growth in knowledge worker intelligence, span and absorptive capacity. There is a deeper issue – not just tasking, but equipping. Managers’ development to this point has been focused on performance in the business as it is. They need that part of them exercised that can hold both the now and the not yet (or as Wheelwright (1982, 19) calls them, the “what just was” and the “what is just about to be”)(4). But adaptive capability is no longer sufficient if confined to senior personnel. Bringing conversation into our explicit capability set unlocks growth in adaptive expertise. Garry Hamel is one who has seen that this kind of expertise is not the exclusive province of senior management. Of course, failure there is often acute and catastrophic, while at the levels of the organisation closer to the customer, the disease of excessive specialism is more chronic. It is simply not functional to face the challenges of constant change if your workforce can only handle the conversations of specialism – of learned routines, settled language and fixed meanings.The modern organisation is a tribute to the extensive, systemic enculturation of ineffective ways of being. In “The Future of Management”, Garry Hamel points out that the DNA of management is based on how to control farmhands to do routine work – and it has succeeded at that. The goal was to make them into semi-automatons. In the context of manual work 100 years ago, nothing was exponential – now most things are. Change has changed. Change is as fast as change itself. Change is taking place so fast and so much that the only thing that can keep up – quite literally – is how we talk together. Because it is in our talking together that we take ideas and possibilities, threats and challenges from the world and make them our own. We fuse the already and the not yet into capability for living well. (3) Judith McMorland Are you big enough for your job? Is your job big enough for you? Exploring Levels of Work in organisations University of Auckland Business Review Spring 2005 75-83 Emphasis mine The levels she refers to are from a model by Elliot Jaques made popular by Gillian Stamp, advanced by Luc Hoebeke, and used throughout organisations such as the Commonwealth Bank, BHP and Rio Tinto. (4) Wheelwright, P. (1982/1968). The burning fountain: A study in the language of symbolism. Gloucester: Peter Smith. In the New Testament, naming is central to the battleground tactics between good and evil. As Jesus walks by, demon-possessed people call out his true name – “We know who you are, Jesus of Nazareth – the Holy One of God”. The demons attempt pre-emptive strikes by being the first to use the true name. Naming has a powerful place in many cultural and literary traditions. I don’t want to disrespect (on the contrary, I delighted in Richard Fortey’s descriptions of the life and times of Dry Store Room No.1), but I do want to distinguish, the more widely observed customs of “labelling” from the work of “naming”. Labelling attempts fine distinctions in “what is”. Labelling is a feature of the Build habitat of conversation. Think of the lists of bits that make up all the purchasing requirements to build a new home. And definition is that form of labelling where we try to pin words like “love” or “design” to the mat (as mercilessly as we pin out type specimens of insects). Our encyclopaedias of language form catalogues of such desiccated words. Naming makes things that were not, and deals in the power of making and un-making. The Scope habitat is where naming takes place, in the fuzzy front end of our encounters, when we are grasping at the edges of things we want to accomplish, and need names in order to begin to move the parts around in our minds – and eventually, to demonstrate our power over them. Naming is a different concept to definition ­– as different as explore is to analysis. Naming takes place when the LEGO group understands it’s purpose in the world is to “inspire children to explore and challenge their own creative potential”, or when Volvo sets out to build cars that create zero road fatalities – including pedestrians – rather than both those firms being labelled as “brick” makers…. This has a very practical corollary for the cognition of design, because a frequent mistake in approaching the cognition of Generate conversations is to treat it as a scaled up version of Build. In the ecosystem of generative conversation (in contrast to the more frequented ecosystem of Build), we sometimes struggle to break free of our educational and disciplinary conditioning in the cognitive paths of technical rationalism. Sugata Mitra (see for example ) makes the case that Build thinking is the well-crafted outcome of an education system designed to suit the bureaucratic machinery of the British Empire. If he is right, we simply cannot under-estimate the formative effect our education has had on narrowing our bandwidth of conversational competencies. Specifically, many design methods (which draw on the Generate conversational habitat) do not adequately distance themselves dispositionally and terminologically from science. They refer to the early stages of design as “analysis”. True, in technical crafts such as engineering, the design process may have require significant and extended analytic sub-routines. But even in that context, to the extent that we use “analytical” thinking (rigorous decompositional logic), it is directed to understanding the situation. “Breaking things down definitely may help understand, but this understanding does not necessarily imply that we should (re)build complex systems that way.” (Resmini, Rosati Pervasive Information Architecture p. 47).